Sprint has launched the dual-mode Samsung IP-30w. The device is based off the Samsung i730 but sports a GSM radio instead of WiFi to allow for worldwide roaming. 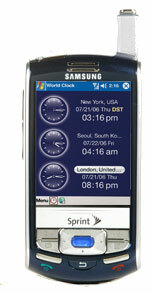 Verizon Wireless launched the handset as the Samsung i830, albeit with an older version of Windows Mobile. The handset features a slide style design to reveal a full QWERTY keyboard. Sprint is selling the IP-830w for $599 after $150 in instant savings and a 2-year service agreement. It's available now.